The experience of an exotic destination adds another level of bonding to weddings and honeymoons. Destinations around the world want to present themselves as idyllic settings for the main event. While these locales may be a little too late for this year’s June brides, they make it worth a couple’s while to marry outside the June zone. While Ireland may be within the temperate zone, Thailand and India can at least promise warmth the year round. Destination weddings can be especially effective when the friends and family are already scattered in different locations around the U.S. and the world. In that case, the wedding serves as a neutral destination. It’s always smart to choose resorts that have wedding planners available. For the modern honeymooner look to make a combination of active traveling and laid back time in a resort setting. Ancient Himalayan monasteries in Bhutan, the rain forests of Sri Lanka, top end resorts in the Maldives, the national parks of India and more. South Asia has become much more accessible to luxury travel with the emergence of Dubai as an aviation hub. Dubai has become a great place for high-end stopovers as well. South Asia, with its legendary commitment to spirituality would make an ideal honeymoon setting for the right couples. Greaves Tours LLC, a specialist in South Asia, created a new 28-page honeymoon destination guide to India as well as other regional destinations like the Maldives, Bhutan, Sri Lanka and Dubai. Greaves can handle even the most opulent honeymooners. One program includes the operator’s private plane. “We’ve designed this destination guide to help couples think beyond the traditional for their honeymoon by showcasing options such as dining at an elephant camp, climbing to the top of an ancient monastery and sipping tea with local monks, or diving into the Indian Ocean straight from their over-the-water villa,” said Ian Cambata, Greaves’ director of business development. Any trepidation about sending a young couple to such exotic far off locales should be assuaged by Greaves’ 30 years of customizing journeys in the region. On the idyllic Thai island of Phi Phi, out in the Andaman Sea, couples can take their vows in a traditional barefoot Buddhist ceremony on a white sand beach at Zeavola. Couples can plant a “love tree” as part of the ceremony. The Thai Wedding Ceremony Package involves monks and is conducted in the morning, with the reception, cocktail and dinner in the evening. It includes a Buddhist prayer ceremony, holy water pouring and bonding ceremony, a floral arch, champagne and cake cutting ceremony. Zeavola’s wedding planners can assist couples with special requests and in navigating the sometimes complete legal requirements of marrying in Thailand. The wedding specialist can organize a Thai marriage certificate. The weddings are enhanced by the resort’s teak wood villas. 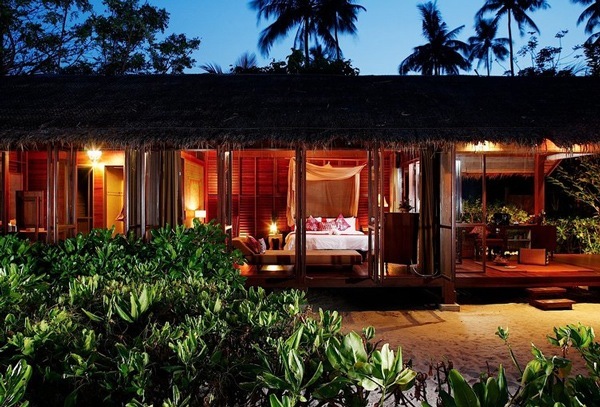 Zeavola’s Pool Villa Suites include private gardens, outdoor rain showers and more. For the Western Wedding Ceremony Package, a celebrant conducts a blessing ceremony with an exchange of vows. If a couple wants the ceremony to be traditionally Christian, a priest can be arranged at extra cost. Divers love the resort because it’s set within a national marine park. The resort can also offer weddings underwater. The Thai Wedding Ceremony and Western Wedding Ceremony are priced at 71,000 baht ($2,192) and 65,000 baht ($2,007) respectively. Beverages are extra and so are a host of other options including make-up and hair, manicure and pedicure, Thai costumes for the bride and groom, photography, VDO and scuba diving. An array of live entertainment options is also available.